I've been on the lookout for a book that can accurately portray Alzheimer's Disease the way I remembered it from seeing my Grandpa Ted suffer from it and the way my Grandma dealt with it as well as many others of my family who helped her. I used to think that my memories were distorted from the fact that I was quite young during this time; my grandfather passed away at the age 90 years old when I was 21. Now, after reading Lisa Genova' s book I think my memories weren't all that tainted. Still Alice is by far, hands down one of the best books I have ever read about Alzheimer's disease. It was captivating, sad and interesting. I learned quite a bit and had little revelations through the main character, Alice's insights of what it must be like to have early-onset Alzheimer's Disease. An amazing edge, for Genova, is the fact that she holds a Ph.D in neuroscience from Harvard. Her research is accurate and well-placed throughout the book. Another fact that I recently discovered is that her grandmother had Alzheimer's, which I'm sure helped motivate her to write this book. Also, many of the medications listed and that helped Alice deal with A.D. are real medicines, with the exception of Amylix, as described in the book. At first Alice starts forgetting things like words when giving a speech or the fact that she is teaching a class, she thinks it might be because of menopause. One of the most poignant scenes for me in the book is when she gets lost jogging near her house, on a route she has taken many times, you feel so much for her in that moment and you want her to remember but she simply can't. She doesn't even realize exactly how long her memory lapses until she suddenly remembers and goes home. At this point, she realizes something is seriously wrong and seeks medical help. For the duration of the book, it remains in Dr. Alice Howland's point of view which according to her physician that she goes to visit when she thinks she is having memory problems and he tells her that since she is reporting that she can't remember things she would need to bring a friend or family member since she might not be totally accurate. Alice is almost fifty, so she is totally unprepared for the diagnosis - early onset Alzheimer's and feels unimaginable denial as does her family. As the disease progresses, Alice and her husband John learn everything they can about the disease and treatments, but Alzheimer's quickly takes its toll on both Alice and her family. 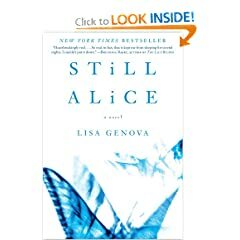 Genova maintains Alice's thoughts and her heart simply unfolds throughout her journey yet I longed to know more of the thoughts from her husband and children. In the end, I came to understand why Genova may have done this which, in my opinion, was to bring awareness of the person who has A.D. that just because they can't remember doesn't mean they don't feel. One way this was illustrated in the book was when Alice finds out that there are plenty of support groups for the caregivers of A.D. persons but none for the A.D. persons themselves. So, Alice starts one of her own while she still can express herself and invite them by using e-mail. She is successful for a short time until the A.D. wins out but that is probably the time that she needed it most. It was heartwrenching actually. I also have to admit this book scared me and really made me think about the challenges you might face about getting older. I recommend this book if you are looking for any fiction reading about Alzheimer's Disease, esp. early onset. Sounds like a really powerful book. I don't think I'm ready to read it though, since my grandpa just died of alzheimers two years ago. It might be a little raw for me at this point. Amanda, I hear what you're saying and I agree that it may be too soon for you to read. My Grandpa passed away about 16 yrs. ago and I've just now been reading books about Alzheimer's. This is a great review Julie! This book sounds even more wonderful and I can't wait to read it.